PLD Space has taken an important step forward in the firm's development of a European reusable launcher. 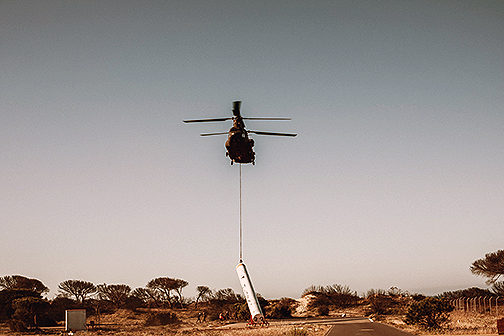 On April 11, the recovery drop test of the first stage of the MIURA 5 rocket was carried out from El Arenosillo Experimentation Center (CEDEA), of INTA (Instituto Nacional de Técnica Aeroespacial). This operation, an essential part of the campaign to develop future launchers (FLPP) of the European Space Agency (ESA), serves the purpose of validating the recovery system of MIURA 5- PLD Space’s first private reusable orbital launcher. 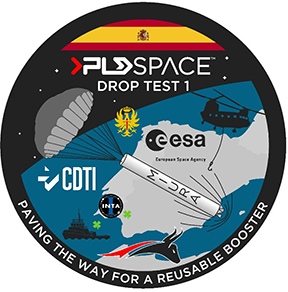 This successful drop places PLD Space in a good position for the further development of this reusable orbital launcher that will allow space access services for smallsats. This test was carried out by the Transport Helicopter Battalion V (Bheltra V), of the Aeromobile Forces of the Army. They released the demonstrator from a height of 5 km. using a Chinook CH-47 helicopter. In the first attempt, an electric problem caused the cancellation of the mission and, after repairing it, the test was started once again. The demonstrator, 15 meters long and 1.4 meters in diameter, fell within a controlled area of â€‹â€‹the Atlantic, located 6 km. from the coast of Huelva, part of a segregated space controlled by INTA. In carefully timed sequence controlled by the electronic systems on-board, a series of three parachutes were ejected to decelerate the demonstrator, until its splashdown in the Atlantic Ocean at a speed of about 10 meters per second. The parachute system was designed and developed by Airborne Systems North America, the company that developed the parachutes for the NASA Apollo capsule, among others. This same parachute system, used aboard the drop test, will be used on MIURA 1 and MIURA 5 flights. Once the demonstrator impacted the water, a team of divers recovered the demonstrator, dragging it back to a nearby tugboat. The demonstrator has been returned to the port of Mazagón after its successful recovery and will be transported back to the headquarters of PLD Space, in Elche, for further analysis. The FLPP-LPSR project has been funded by the European Space Agency (ESA) with the support of the Center for Industrial Technological Development (CDTI). The company reports that this project was complicated and required tremendous organization. This project’s success is due to the support that PLD Space has received from ESA, CDTI, INTA and the Army (Ejército de Tierra) as well as the coordination of companies and other organizations that have participated in the project, such as Tecnalia, Airborne Systems North America, Sensonor, Solycal, Nomasa, Itecam, Mecanizados especiales, Cadamadrid, Talleres Blasco, Sertrain, STS, Helibasket, the University of Alicante and Integral Risk Global.